Reference number for this case: 13-oct-54-Bourrasole. Thank you for including this reference number in any correspondence with me regarding this case. In Montluçon, a railwayman calls a "Martian"
Toulouse, October 14 (A.F.P.). -- A small diver with a large head compared to the body, huge eyes, such is the description just made by a resident of Toulouse, Mr. Oliver, of a mysterious personage who descended from a strange machine that he saw yesterday at 7:15 p.m., on a vacant lot. Mr. Olivier, who owns the Javel Netto establishments in Toulouse, was accompanied by an employee, Mr. Perano, and a young boy of about fifteen. All three saw the luminous apparatus, of spherical shape and reddish color, and then perceived coming to them this "personage" whose scuba, the witnesses said, shone like glass. 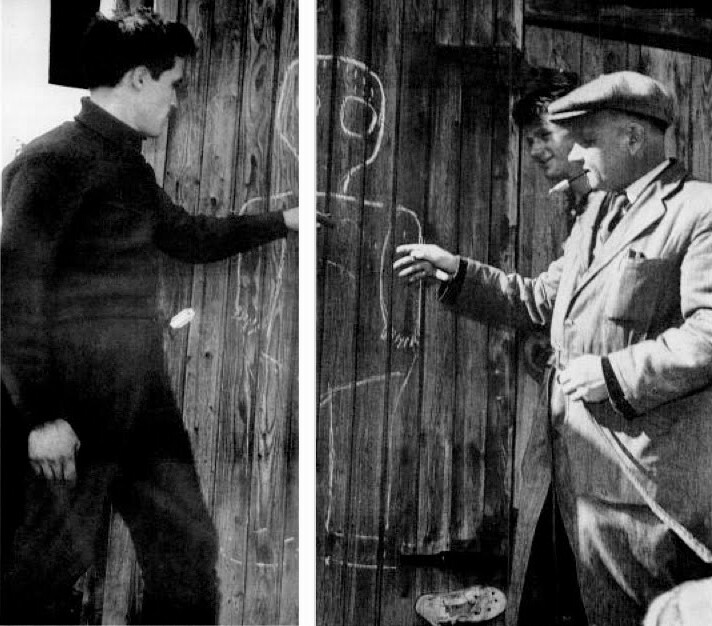 Subsequently, M. Olivier drew with a chalk, in an approximate manner, on a door, the diver. "I did not believe in it," Perano said, "but I saw it just as I see you. It's a shock." After a very short time, about a minute, the diver returned to his flying saucer, which flew vertically without noise into the sky at a prodigious speed, throwing a wake of fire. Due to the night no finding could be made at the place where the machine was said to have landed. The flying saucers file has been increased with several testimonies, the most important being that of an employee at the Montluçon railway station, Mr. Laugère, who made contact on Sunday evening with an individual from a craft in the form of a torpedo. Mr. Laugere left his work and crossed the tracks near the bridge of the S.N.C.F. on the road "Le Cher" when he saw a metallic machine posed at a short distance from the gas oil tank intended for the fueling of railcars. By the side of the apparatus, which had the shape of a torpedo, and could be four meters in diameter, there was a man, all covered with hair, unless he were dressed in a long-haired coat. Mr. Laugere, surprised, asked him what he was doing. The unknown replied in unintelligible terms, but the railwayman thought he distinguished the words "gas oil". Mr. Laugere did not ask him for anything more, and went to alert his comrades. As soon as he had gone a hundred yards, he saw the apparatus rise vertically without any noise. It soon disappeared before his eyes. Only the fear of the irony of his comrades had prevented him, till today, from telling his adventure. Mr. Jean-Pierre Bartarange, a farmer in La Roche-de-Vic, in the commune of Albussac (Correze) saw a flying saucer throwing fires of several colors. It was flying at low altitude. Toulouse, October 14. -- Yesterday in Toulouse an event so extraordinary occurred, that all the city talks about it. The witness, Mr. Olivier, one is not a crackpot. He is the owner of a factory, and a former plane pilot. It is while crossing a garden, as he returned home, that he saw at approximately 80 meters, a kind of luminous ball, of reddish color, posed on the ground, in front of a tree trunk, near a bordering soccer field. He at once alerted a neighbor, Mr. Perano, to make him note the phenomenon. But the two men's surprise was great, when they saw a being, moving close to the luminous ball, a human form, of small size and dressed of a kind of diving-suit of orange color. Another witness joined the two men then. Without losing his head, Mr. Olivier hastened to draw on a nearby door the silhouette of the "Martian", estimating, not without reason, that it was the surest means to engrave it in his memory. A camera would have made the deal certainly better, but Mr. Olivier did not have any at hand - neither did Mr. Perano - and the strange unknown had not left him time to get one. Either to escape the curiosity of which he was the object, or for any other reason known only of him, he penetrated in his ball, and the latter rose immediately in the sky at a pace that the two witnesses did not hesitate to qualify as a vertiginous one, leaving behind a trail of sparks of a striking effect. An investigation is started to try to elucidate certain still obscure aspects of this new manifestation of the interplanetary relations. stated that the saucer was surrounded by iridescent reflections and emitted a slight fog around it. He added that having wanted to approach, he had been stopped at about twenty meters by a paralyzing force and that when the machine had risen in the sky, he was violently thrown at the ground. Hamburg, October 13. -- "The "flying saucers" pilots are plants gifted of reason". Such is the theory that professor Hermann Oberth, inventor and manufacturer of the famous "V-2" rocket exposed to a correspondent of the France-Presse Agency. According to the German scientist, the "Uranides" (such is the name with which he baptizes these plants) have thousands of years in advance on the earth men as well with regard to their spiritual evolution as their technology.The fatherland of the Uranides would be a planet where oxygen in a gas state does not exist, which prohibits the development of animal life. The plants, on the other hand, draw the oxygen they need from oxides contained in the ground. The said planet would be apart from the solar system, but the mysterious machines in which the intelligent plants move might travel at a speed close to that of the light (300.000 kilometers per second). Those of these machines seen above the earth would have a mission to watch progresses of earth's humanity in atomic sciences because this progress "represents a danger to the entire cosmos". Toulouse. -- A small being wearing a diving suit, with large head in comparison to the body, two enormous eyes, such is the description that Mr. Olivier gave Wednesday evening in Toulouse, of a mysterious character descended from a spherical machine which had been just landed at 07:30 P.M., on a vacant site. Mr. Olivier, owner of Establishments Javel Neto, rue des Fontaines, in Toulouse, was accompanied by an employee, Mr. Perano, and of a young boy aged about fifteen years. All three saw the luminous craft land, it had a spherical shape and a reddish color. Then, they saw the character whose diving-suit according to the witnesses statement shone like glass, come towards them. Thereafter, Mr. Olivier drew the diving suit equipped being in an impressive manner, with chalk, on a door. "I did not believe in it, added Mr. Perano, but I saw it as I see you. That was quite a shock." After a very short time, approximately a minute, the diver regained the luminous sphere which flew away vertically, without noise, and disappeared in the sky at an extraordinary speed leaving a trail of fire. Because of the night, no observation could be done at the place where the machine is said to have landed. Oily traces were noted Thursday morning in several place of a vacant site located in a suburb of Toulouse. According to declarations of the three witnesses, the mysterious craft, piloted by a character wearing a diving suite had landed on this location yesterday at 07:35 P.M. The Air Police Force interrogated these three people, among whom figure an industrialist, they maintained their statement, specifying that the mysterious individual measured approximately 1 m 20, exceeded the machine with his head and had, consequently, to bend to penetrate there. One of the witnesses insisted that the saucer was surrounded by iridescent reflections and emitted a light fog around it. He added that having wanted to get closer, he had been retained at about 20 meters of it by a paralysing force and that, when the craft rose in the sky, he had been violently thrown to ground. TOULOUSE, 14. -- A small being wearing a diving suit, with large head in comparison to the body, two enormous eyes, such is the description that Mr. Olivier gave Wednesday evening in Toulouse, of a mysterious character descended from a spherical machine which had been just landed at 07:30 P.M., on a vacant site. Mr. Olivier, owner of Establishments Javel Neto, in Toulouse, was accompanied by an employee, Mr. Perano, and of a young boy aged about fifteen years. All three saw the luminous craft land, it had a spherical shape and a reddish color. Then, they saw the character whose diving-suit according to the witnesses statement shone like glass, come towards them. One of the witnesses said that the saucer was surrounded by iridescent reflections and emitted a light fog around it. He added that having wanted to get closer, he had been retained at about 20 meters of it by a paralysing force and that, when the craft rose in the sky, he had been violently thrown to ground. A diver of small size, with a large head compared to the bodies, two enormous eyes, such is description that has just made a resident of Toulouse, Mr. Olivier, of a mysterious character that descended from a spherical machine which had been just landed on a vacant site. Mr. Olivier, owner of the establishments Javel Neto, street of the fontaines in Toulouse, was accompanied by an employee, Mr. Perano and a young boy of about fifteen years old. All three saw the luminous machine of spherical form and reddish color land, then saw coming towards them the character whose diving-suit, according to the statements of the witnesses, shone like glass. Thereafter, Mr. Olivier, former airplane pilot, drew with chalk in a stunning manner, on a door, the diver. "I did not believe in it", added Mr. Perano, "but I saw it as I see you. That does the hell of a shock to you". After a very short time, approximately a minute, the diver regained the luminous sphere which flew away vertically, without noise and disappeared in the sky at a vertiginous speed while leaving a wake of fire. One of the witnesses ensured that the saucer was surrounded by iridescent reflections and emitted around itself a light fog. He added that having wanted to approach, he had been retained at a score of meters by a paralysing force and that, when the machine rose in the sky, he had been violently thrown to the ground. ... which was nothing else than a car! Paris, October 21 (Agence France Presse). -- A Parisian weekly magazine tried a curious experiment. Wishing, according to THEIR OWN WORDS, to show the share of the individual or collective hallucination in the many "applications" [sic; appearances] of mysterious craft landing with their pilots in the French countryside, this weekly magazine sent two "Martians" in exploration in the south-west of France. The accessories of the perfect "Martian"
Equipped with the perfect "Martian" disguize, as imagined by authors of certain books and films of scientific [sic] science fiction, two reporters, covered with rubber diving-suits, capped with enormous helmets of copper pierced with portholes, went on board a "saucer" which was nothing else than an honest car, to appear to the peaceful farmers of the area of Toulouse. The two "Uranides" had carried in their luggage complete implements of fireworks experts: red, green and white Bengal lights, "Roman candles" - guns launching small green or red balls of fire at fifteen meters - flying rockets, going up up to fifty meters. Armed with these fireworks accessories, the two reporters approached, at night of course, in front of several insulated farms. The first Bengal light made the lights of the farm die out. With the second, a door squeaked, somebody carefully came out on the threshold, while the dog howled to death. This is the time that the fake "Martians" chose to launch a rocket and to promptly regain their car which they had dissimulated, all fires extinguished, behind a hedge. In front of one of the visited farms, the two jokers met a "terretrial" pushing her bicycle. "She threw her bicycle in the ditch and rushed towards the farm, they told." "One of us barred the way to her. She sais: "Jesus, Mary, Joseph!"! We were not malicious "Martians." We left her there , a little sad, in the end, that we had not helped her to pick her bicycle up." But the adventure of the reporters almost turned bad in a hamlet close to Montauban, in the honor of which eight rockets had been fired. A furious farmer advanced to confront the "Martians ", holding up a pickaxe above his head. This terrestrial was afraid of nothing, neither of the "paralyzing" ray of the flashlights of the invaders, nor of the incandescent bubbles. Other farmers joined him, ready to organize a hunt. Both reporters had only time to fly away on board their four wheels "saucer", the green rocket simulating the departure of the "spacecraft". To supplement the experiment, the two journalists have toured again, by day, and without disguise, the round which they had made as visitors of another world. Naturally, the unterrogated people often made diverting answers. In the same farm, some "had seen" the "Martians", others saw only the "saucer." Some saw "giants," others saw small men of one meter twenty! Skeptics affirmed that they "did not believe in it," spoke of shooting stars, rockets or odd objects about which they avoided coming to a conclusion. The newspapers seized these various testimonys, presenting them generally admittedly with loads of question marks! The weekly magazine stresses that the purpose of its experiment was not at all to ridicule the witnesses of strange phenomena, nor to question their good faith, but only to explain of fragile the testimonys of the "terrestrials" are. OLIVIER: - That's my Martian! With the accent of the country of Clemence Isaure, Olivier tells his big adventure. "I was not going to run the risk to forget the features of the Martian. Those who had the privilege to meet some of them are not so numerous. Immediately, on the door of the toilets, I drew mine with a chalk. In the district of Croix-Daurade, not far from the way of Lanusse, a gentle whistling sound caught my attention. Leaving behind it an intense luminous trail, a kind of giant rocket landed in a field masked by a nearby hangar. I ran and, there, I saw, I saw with my own eyes, a diving-suit of approximately 1 meter 20. It irradiated a slight fog and when I wanted to approach more, I was like paralysed". Jimmy Guieu indicates that on October 13, 1954 a landing of flying disc took place on a vacant site located in a suburb of Toulouse, and that the police force of the Air questioned the three eyewitnesses, including an industrialist, former airplane pilot, and they firmly confirmed their statements. At 19:35 they saw on the ground a discoid spacecraft 3.50 to 4 meters in diameter approximately, with a being, 1.20 meters tall approximately, dressed of a diving-suit, who stood next to the craft, its head exceeding the maximum height of the apparatus, the pilot thus having to bend to get inside. The saucer was surrounded by iridescent reflections and generated around it a slight fog. One of the witnesses had wanted to approach, but was stopped and paralysed at some 20 meters of the craft, and when it machine, and when it took off vertically, he was violently thrown to the ground. M. Olivier, an ex-pilot, and two others, saw a reddish disc about 12 feet in diameter with a small being close by. This incident took place on October 13, 1954, in Bourasole, near Toulouse, France. The three men were not together but all saw the same thing. They reported that a small being, about four feet in height, wearing a bright suit "like glass," with a large head and two enormous eyes, was near the craft, which was surrounded by a glow. One of the men approached the object, but was paralyzed. The object then took off, throwing the man to the ground. Oct. 13, 1954, 07:35 P.M., Bourrasole (France). The author indicates that the incident "O and P." was the most clearly claimed of the pranks by the journalists of Samedi-Soir, and clearly appears to date from October 13, around 07:35 p.m.. He indicates that there were two A.F.P. news releases on October 13, and 14. The sunset was at 05:05 p.m. there and the pranksters said that they wen to the suburbs of Toulouse when the the sun was set for an hour; which coincidence rather well. The journalists came by car, stopped it and at least one of the two came out in a diving-suit to make a rapid tour, close to the car, and fled after having launched two or three rockets. "After a very short time, approximately a minute, the diving-suit got back into the luminous sphere which flew away vertically without noise and disappeared in the sky at an extraordinary speed, leaving a wake of fire." "The mysterious individual (the diver) measuring approximately 1 m 20, was taller than the machine of one head and was, consequently, had to bend himself to go inside" and the saucer "emitted a light fog around it." Having wanted to approach, one of the witnesses "was retained at some 20 meters by a paralysing force" and even adds that "when the machine rose in the sky, he was violently thrown to the ground." The author indicates that on October 13, 1954, in Bourrassole, close to Toulouse, Mr. Olivier, former pilot, Mr. Perano and a third witness, saw a reddish disc approximately 4 meters in diameter with a small being close to him. The individual had about 1 m 20 height and wore a diving suit. "Its head was large compared to the remainder of the body, and it had enormous eyes. Clothing was brilliant and shining like glass." The apparatus was surrounded by a kind of gleam. One of the men approached with less than 20 meters, but was paralysed. The apparatus flew away, by rejecting it on the ground, then rose very quickly. Toulouse, October 13 1954, at about 19:35. References: newsclipping, personal files. While returning at his home, an industrialist, Mr. Olivier, sees a luminous ball landing close to a football field, at a hundred meters of him. Near it, he soon distinguishes a being from small size which seems to him clothed of a diving-suit. Mr. Olivier calls one of his neighbors, Mr. Perano. The two men then see the "diver" entering in the machine by bending themselves down. At this time a third witness arrives, who wants to approach the thing. He is stopped by a "paralysing force" when he comes to a score of meters. The machine takes off without noise and disappears in the sky leaving a trail of fire. The nearest to the three men is violently thrown to the ground at the time when the machine leaves the ground. The authors indicate that on October 13, 1954, in Bourasole, near Toulouse, France, Mr. Olivier, an ex-pilot, and two others, separately saw a reddish disc about 12 feet in diameter with a small being close by. The three men reported that the being was about 4-feet tall, wearing a bright suit "like glass", it had a large head and two enormous eyes. The craft was surrounded by a glow. One of the men approached but was paralyzed, and the object then took off, throwing the man to the ground. The author indicates that on October 13, 1954, in Bourasole, near Toulouse, France, Mr. Olivier, an ex-pilot, and two others, separately saw a reddish disc about 12 feet in diameter with a small being close by. The three men reported that the being was about 4-feet tall, wearing a bright suit "like glass", it had a large head and two enormous eyes. The craft was surrounded by a glow. One of the men approached but was paralyzed, and the object then took off, throwing the man to the ground. 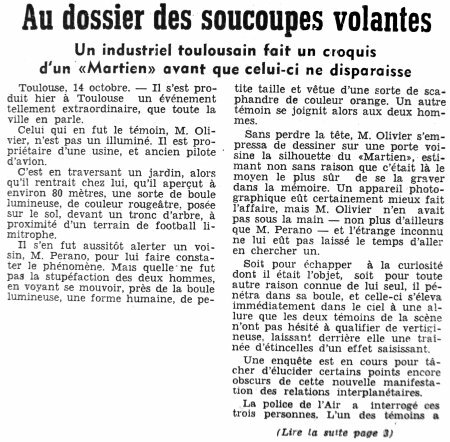 The author indicates that Mr. Olivier, a former plane pilot, in Bourrasole, close to Toulouse, ran up against a small being of 1,20 m wearing a clothing similar to a diving-suit. Two other witnesses confirmed his statements: "Its head was large compared to the rest of the body, and it had enormous eyes." 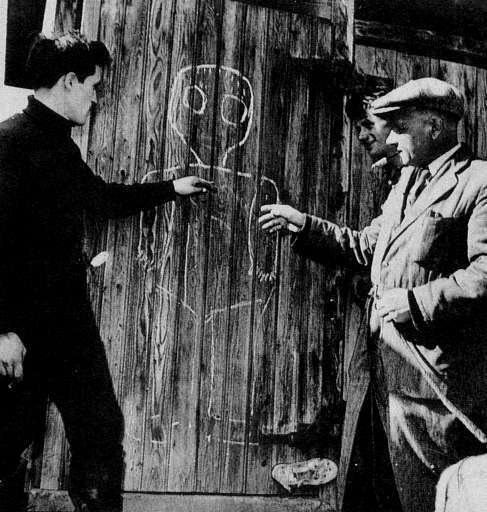 The American ufologist indicates that on October 13, 1954, in France, in Bourrasole, Messrs Olivier and Perano, and a third man, not identified, saw a reddish disc of approximately four meters in diameter with a small being of 1.20 approximately wearing a "diver's suit" standing near. One of the witnesses said that "its head was large compared to the remainder of the body, and it had enormous eyes. The clothing was shining and reflecting like glass." The machine was surrounded by a vaporous light. One of the witnesses went at some 20 meters and was paralysed. The machine left while throwing him at the ground. The author indicates that this example of case of a close encounter of the third kind comes from the catalogue by Jacques Vallée who extracted it from Aimé Michel's book. "A diver with enormous eyes gone down from a mysterious machine appears to three residents of Toulouse." "A diver of small size with a too large head compared to the body, two enormous eyes, such is the description made the day before yesterday evening by Mr. Olivier of Toulouse, of a mysterious figure descended from a spherical machine which had just landed, at 07:35 p.m., on a vacant site located in a suburb of Toulouse." Mr. Olivier, owner of the establishments Javel Neto, rue des Fontaines, in Toulouse was accompanied by an employee, Mr. Pérano and of a young boy of about fifteen years old. All three saw the landing of the luminous machine, of spherical shape and reddish color. Then they saw to come towards them the figure whose diving-suit, according to the statements of the witnesses, shone like glass." Thereafter Mr. Olivier former aviation pilot, drew with a chalk, in a stunning manner, on a door, the diver. 'I did not believe in it, Mr. Pérano added, but I saw him like I see you. That was quite a shock'. After a very short time, approximately a minute, the diver regained the luminous sphere, which flew away vertically, without noise and disappeared in the sky at an extraordinary speed, leaving a wake of fire." Oily traces were found yesterday morning in several places of the ground where the machine was posed." The three people who saw this phenomenon, questioned by the police force of the air, maintained their statements. They specified that the mysterious individual, measuring 1,20 m, exceeded the apparatus by the and had consequently to bend to enter in it." One of the witnesses ensured that the saucer was surrounded by iridescent reflections and emitted a light fog around itself, he added that having wanted to approach, he had been retained within some twenty meters by a paralysing force and that, when the apparatus rose in the sky, he was thrown violently to the ground." The authors regret that Jacques Vallée makes brief summaries, and claims it happened in Toulouse whereas it happened in Bourrasol, that Vallée mispells Bourrasole, that Vallée might have changed the names so that the explanation cannot be found, that the case formed part of a series of mystifications by two journalists of the weekly magazine "Samedi-soir", Michel Agnellet and Pierre Laforêt. They say Laforêt confirmed this and that an article in Samedi-soir for the week of Pctober 21-27, 1954, with photographs, displayed the whole series of the journalists's hoaxes. The two authors indicate that on Tuesday, October 12, 1954 at 4 hours in the morning, two residents of the Toulouse suburbs saw a machine in the shape of giant rocket which rose from a field at a hundred meters of their house. It disappeared quickly in the sky, generating a clearness of a rare intensity. In the center of this zone they discovered four prints in the ground appearing to have been left by the heavy apparatus. The grass was covered with droplets coming from a fatty vapor condensation and which released an oil odor. There was an investigation by the Air Police. According to Michel Figuet et Jean-Louis Ruchon, journalists of "Samedi-Soir" who had faked a UFO earlier by launching a rochet in Graulhet, decided to ridicule the inhabitants of Toulouse. They put on diving suits, used a car disguized in spacecraft and used Bengal lights and fireworks. The witnesses were the victims of the prank by the journalists of Samedi-soir. "OVNI" p. 669. How did the journalists proceed to cause the paralysis of the witness? How did the car of the journalists rise in the air, throwing the nearest witness at the ground? How could the witness, probably Mr. Olivier who according to Jimmy Guieu was a former pilot, be fooled by a few petards? He notes then that the article in "Le Soir" indicates that the two journalists would have practised their art "in front of various isolated farms" while the case in question occurs in urban environment. He notes that the Radar magazine had sent its journalists to the site and that according to them it is not Mr. Pérano but Mr. Panero. The Belgian ufologist indicates that on October 13, 1954 in France in Toulouse, in Bourrassole, at 7:35 p.m., three witnesses, Misters Olivier, Pérano and another witness, saw a disc 4 m in diameter and a humanoid being of small size in a diver's suit. Compared to the body it had a large head and two enormous eyes. His clothing shone like glass. The craft was surrounded by a kind of misty brightness. One of the witnesses approached up to 20 m the machine where he was paralysed, while the apparatus took off at high speed, throwing him to the ground. The sources are indicated as Paris-Presse, Libération, 15 oct 1954, La Croix, 16 oct 1954; and Jacques Vallée: "Chronique des apparitions ET" - Denoël 1972 - J'Ai Lu Coll. - p. 279; and Michel Bougard: "Des S.V. aux OVNI" SOBEPS 1976 - p. 211. Godelieve van Overmeire indicates that the other version is that actually, returning from Graulhet, the journalists of "Samedi-Soir" decided to have fun at the expense of the Toulouse residents. Covered of their diving suits, they manoevered in front of a red firework and shot a a fireworks rocket. The source for this other version is indicated as M. Figuet/ J.L. Ruchon: "Ovni, premier dossier complet..." - Alain Lefeuvre pub. 1979, p. 669. Keith Basterfield indicates that on 13 October 1954 in Bourrasole, France, 3 people, Perano, Olivier and one more, saw a 4m diameter disk-shaped UFO with one small being. This being was 1.2m tall, wore a diving suit. One person approached the object within 20m and was paralysed. When the being entered the object and flew away, the immobilised person was thrown to the ground, and the craft left. The source is indicated as: Bowen, C. 1969. The Humanoids. Neville Spearman. London. pp44-45. and humanoid. A journalistic prank. Three people (not together) saw a reddish disc-shaped craft about 12' diameter. They all reported a being in a shiny silver suit with a large head & enormous eyes. A witness reported that he saw a small creature with large eyes near a small disc-shaped craft. Donald Johnson indicates that on October 13, 1954, Messrs. Olivier and Perano and a third man in Bourrasole, France, saw a reddish disc about 4 meters in diameter with a small humanoid close by. The being stood about 1.2 meters (5 feet) tall, wearing a diving suit. "His head was large with respect to the rest of the body and he had two enormous eyes. The suit was bright and shiny like glass." The Disc was surrounded by a sort of misty glow. One of the witnesses came within 20 meters of it and found himself paralyzed. The craft took off, throwing the man who stood closest to the ground, and rose into the sky very fast. The sources are indicated as La Croix, October 16, 1954; Jacques Vallee, Passport to Magonia, p. 227. Mr. Olivier and Perano and a 3rd man saw a reddish disc about 12 ft in diameter, with a 4 foot being close by, wearing a "diving suit." His head was large with respect to the body and he had 2 enormous eyes. The suit was bright and shiny like glass. A sort of misty glow surrounded the craft. One of the men came within 20 yards of it and found himself paralyzed. The craft took off, throwing him to the ground, and rose very fast. Jérôme Beau indicates that on October 13, 1954 at 19:35 in Bourrasole (France), Misters Olivier and Perano and one 3rd man see a reddish disc approximately 4 m in diameter with, nearby, 1 small being approximately 1,20 m in height, carrying a divers' suit. He has a large head, compared to the remainder of the body, and 2 enormous eyes. The clothing gltters and shines like glass. The apparatus is surrounded by a kind of misty brightness. One of the men approached at 20 m and is paralysed. The machine takes off, throwing him on the ground, and rises very quickly. The sources are indicated as Paris-Presse, Libération, October 15, 1954, La Croix, October 16, 1954. Michel Padrines indicates that on October 13, 1954, at 19:35 in Bourrasole, Misters Olivier and Perano and one 3rd man see a reddish disc approximately 4 m in diameter with, nearby, 1 small being approximately 1,20 m in height, carrying a divers' suit. He has a large head, compared to the remainder of the body, and 2 enormous eyes. The clothing gltters and shines like glass. The apparatus is surrounded by a kind of misty brightness. One of the men approached at 20 m and is paralysed. The machine takes off, throwing him on the ground, and rises very quickly. The website indicates that on 13 October 1954 19:35 in Bourrasole, France, there was a close encounter with a an unidentified craft and its occupants. The explanation is: Hoax. "One luminous disc, about 20 feet across, was observed by three male experienced military witnesses in a city briefly. One 4-foot-tall dwarf, wearing a diver's suit, was seen." The website indicates that on 13 October 1954 at 19:35 in Bourrasole, France, Messrs. Olivier and Perano and a third man saw a reddish disk about four meters diameter with a small being close by, about 1.2 meters tall, wearing a diving suit: "His head was large with respect to the rest of the body and he had two enormous eyes. The suit was bright and shiny like glass." The craft was surrounded by a sort of misty glow. One of the men came within 20 meters of it and found himself paralyzed. The craft took off, throwing him to the ground, and rose very fast. The website comments that "A flying disc was observed. Physiological effects were noted. Multiple independent witnesses. One red saucer, about 20 feet across, was observed by three male experienced military witnesses in a city briefly (Olivier; Ott). One 4-foot-tall dwarf, wearing a diver's suit, was seen." The website further adds that "Mr. Olivier and Perano and a 3rd man saw a reddish disc about 12 ft in diameter, with a 4 foot being close by, wearing a "diving suit." His head was large with respect to the body and he had 2 enormous eyes. The suit was bright and shiny like glass. A sort of misty glow surrounded the craft. One of the men came within 20 yards of it and found himself paralyzed. The craft took off, throwing him to the ground, and rose very fast." The sources are indicated as Guieu, Jimmy, Flying Saucers Come from Another World, Citadel, New York, 1956; Vallee, Jacques, Challenge to Science: The UFO Enigma, Henry Regnery, Chicago, 1966; Rosales, Albert, Humanoid Sighting Reports Database. Messes Olivier and Perano, along with a third man, saw a reddish disc about 4m in diameter. Nearby was a small being, about 1.2m tall, wearing a bright, shiny, glass like, diving suit. Its head was large in comparison to the rest of its body and it had two enormous eyes. The object was surrounded by a sort of misty glow. One of the men approached within 20m and was paralysed. The object took off, throwing him to the ground, and rose very fast. Some researchers labelled the case a press hoax, others disagreed. Vallee Case 249 citing La Croix 16 October 1954 + Paris Presse + Liberation 15 October 1954. 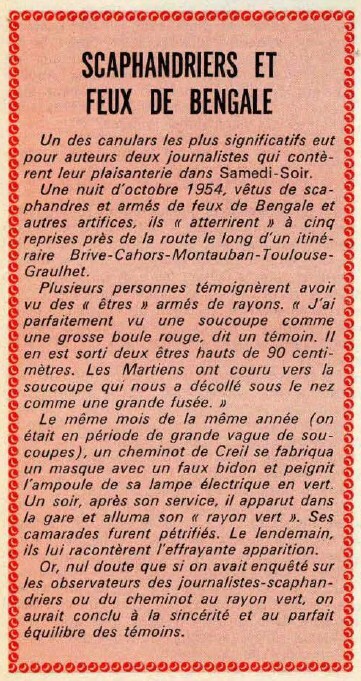 Samedi Soir 27 October 1954. *Oct. 13, 1954 - On that same night at 7:35 p.m. Messrs. Olivier and Perano and a third man in Bourrasole, France saw a reddish disc about 4 meters in diameter with a small humanoid close by. The being stood about 1.2 meters (5 feet) tall, and was wearing a diving suit. "His head was large with respect to the rest of the body and he had two enormous eyes. The suit was bright and shiny like glass." The Disc was surrounded by a sort of misty glow. One of the witnesses came within 20 meters of it and found himself paralyzed. The craft took off, throwing the man who stood closest to the ground, and rose into the sky very fast. (Sources: La Croix, October 16, 1954; Jacques Vallee, Passport to Magonia, p. 227, case # 249). Mr. Olivier and Perano and a 3rd man saw a reddish disc about 12 ft in diameter, with a 4 foot being close by, wearing a “diving suit.” His head was large with respect to the body and he had 2 enormous eyes. The suit was bright & shiny like glass. A sort of misty glow surrounded the craft. One of the men came within 20 yards of it & found himself paralyzed. The craft took off, throwing him to the ground, and rose very fast. This database recorded the case 15times instead of one! The rare photograph below was taken just after the sighting. On the left, Mr. Perano, on the right, his boss Mr. Olivier; the third witness is the young man behind Mr. Olivier. 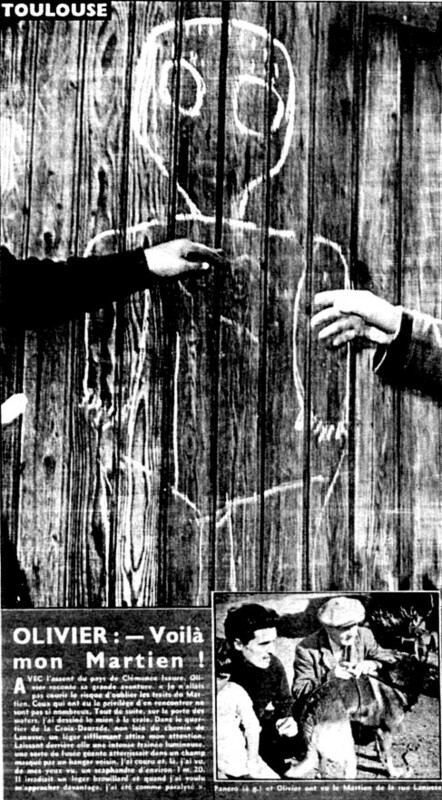 As it was rather usual at the time, a drawing was made with chalk on some door for the Press photographer. [---] News release by Agence France Presse (A.F.P. ), France, October 13, 1954. [---] News release by Agence France Presse (A.F.P. ), France, October 14, 1954. 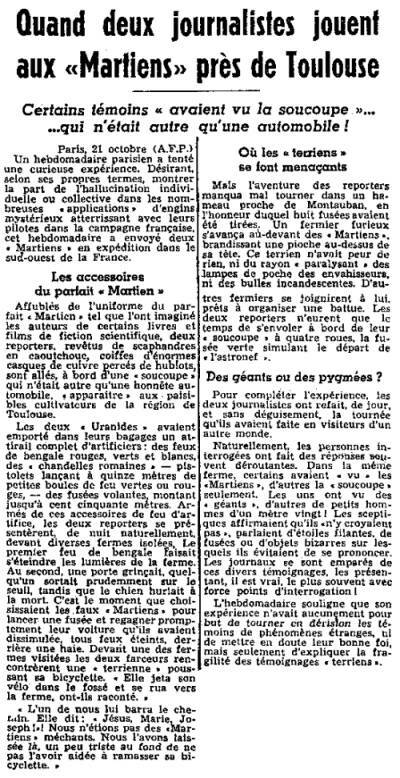 [pc1] Article in the regional newspaper Le Populaire du Centre, France, October 15, 1954. 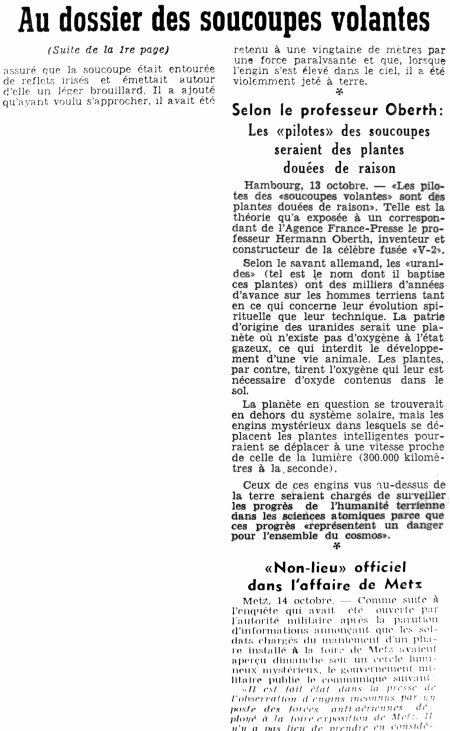 [la1] Article in the regional newspaper L'Alsace, Mulhouse, France, October 15, 1954. [cm1] Article in the regional newspaper Centre-Matin, Montluçon, France, page 8, October 15, 1954. 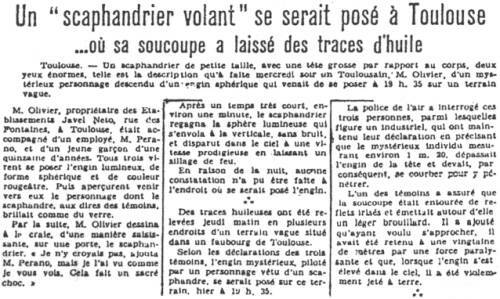 [so1] Article in the national newspaper Le Soir, Bruxelles, Belgium, October 22 or 23, 1954. [ra1] Article in the magazine Radar, Paris, France, page 3, October 24, 1954. [jg1] "Black-Out Sur Les Soucoupes Volantes", book by Jimmy Guieu, Fleuve Noir publisher, page 189, France, 1956. [mc1] "Les Apparitions de Martiens", book by Michel Carrouges (aka Louis Couturier), Fayard publisher, France, page 165, 1963. [lo2] "Flying Saucer Occupants", book by Coral and Jim Lorenzen, Signet Books publisher, USA, pp 95-96, 1967. [lo1] "Flying Saucer Occupants", book by Coral and Jim Lorenzen, Signet Books publishers, USA, pp 95-96, 1967. [jv1] "Passport to Magonia - On Ufos, Folklore, and Parallel Worlds ", book by Jacques Vallée, Contemporary Books publisher, USA, page 227, 1969. [jv2] "The Humanoids: a survey of world-wide reports of landings of unconventional aerial objects and their alleged occupants", book by Charles Bowen, Neville Spearman publisher, U-K., pp 44-45, 1969. [jg1] "Black-Out Sur Les Soucoupes Volantes", book by Jimmy Guieu, Omnium Littéraire publisher, France, pp 215-216, 1972. [gl1] "Face Aux Extra-Terrestres", book by Charles Garreau and Raymond Lavier, Delarge publisher, France, page , 1975. [---] "Des Soucoupes Volantes aux OVNIS", book by Michel Bougard, published by the SOBEPS, Belgium, page 211, 1976. [hj1] "Chasseurs d'OVNI", book by "François Gardes", pseudonyme of Henri Julien, Albin Michel publisher, France, page 147, 1977. [ls1] "Situation Red: The UFO Siege! ", book by Leonard Stringfield, Doubleday and Co publisher, USA, 1977. [ls1] "Alerte Générale OVNI", book by Leonard Stringfield, French translation of "Situation red: The UFO siege! ", France Empire publisher, USA, pp 113-114, 1978. [bb1] "La Grande Peur Martienne", book by Gérard Barthel and Jacques Brucker, Les Nouvelles Editions Rationalistes éditeur, France, pp 94-96, 1979. [fr1] "OVNI, Premier Dossier Complet des Rencontres Rapprochées en France", book by Michel Figuet and Jean-Louis Ruchon, Alain Lefeuvre publisher, France, page 669, 1979. [---] "Faces of the Visitors", book by Kevin Randle and Russ Estes, Fireside publishers, USA, page 268, 1997. [js1] "Le Dossier 1954 et l'Imposture Rationaliste", book by Jean Sider, Ramuel publisher, France, pages 198,231,253, 1997. [lh1] "A Short List of Discredited UFO Sightings", compiled by Larry Hatch, July 2003, in The International Roswell UFO Museum Newsletter, USA, page 4, September 2003. 0.1 Patrick Gross April 24, 2003 First published. 1.0 Patrick Gross December 27, 2008 Conversion from HTML to XHTML Strict. First formal version. Addition [jb1]. 1.1 Patrick Gross December 29, 2008 Addition [lo1], [go1], [kb1], [lh1], [dj1], [mp1], [ud1], [ud2]. 1.2 Patrick Gross April 23, 2009 Addition [bb1]. 1.3 Patrick Gross March 13, 2010 Addition [jg1]. 1.5 Patrick Gross June 13, 2010 Addition [la1]. 1.6 Patrick Gross June 29, 2010 Addition [jv5]. 1.7 Patrick Gross August 17, 2010 Addition [vm1]. 1.8 Patrick Gross October 21, 2011 Addition [lo2]. 2.0 Patrick Gross September 25, 2014 Additions [hi1], [ni1], [ta1]. 2.1 Patrick Gross October 7, 2016 Addition [ra1]. 2.2 Patrick Gross December 6, 2016 Additions [er1], [ub1]. 2.3 Patrick Gross January 7, 2017 Addition [cn1]. 2.4 Patrick Gross January 19, 2017 Addition [pc1].